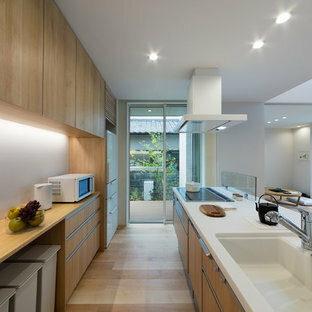 Photo of an asian u-shaped separate kitchen in Perth with flat-panel cabinets, medium wood cabinets, stainless steel appliances, no island, beige floor and grey benchtop. Asian l-shaped eat-in kitchen in Perth with an undermount sink, flat-panel cabinets, grey cabinets, stainless steel appliances, an island and grey floor. 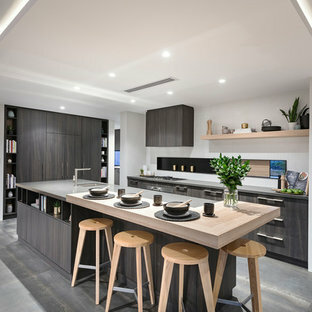 Photo of an asian single-wall open plan kitchen in Other with stainless steel benchtops, porcelain splashback, a single-bowl sink, flat-panel cabinets, black cabinets, medium hardwood floors and brown floor. 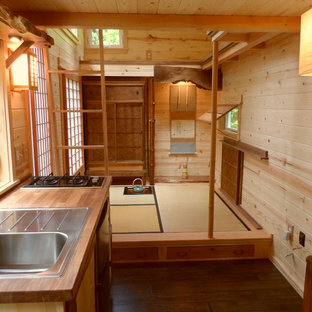 This is an example of an asian l-shaped eat-in kitchen in Other with a drop-in sink and a peninsula. 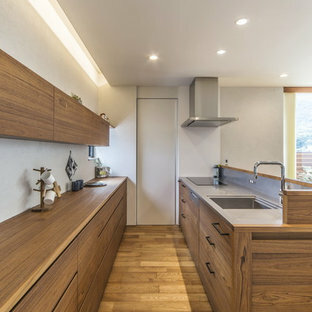 Inspiration for a small asian u-shaped open plan kitchen in Portland with a drop-in sink, wood benchtops, flat-panel cabinets, medium wood cabinets, stainless steel appliances, dark hardwood floors, no island and brown floor. Our brief was to create a calm, modern country kitchen that avoided cliches - and to intrinsically link to the garden. A weekend escape for a busy family who come down to escape the city, to enjoy their art collection, garden and cook together. The design springs from my neuroscience research and is based on appealing to our hard wired needs, our fundamental instincts - sociability, easy movement, art, comfort, hearth, smells, readiness for visitors, view of outdoors and a place to eat. The key design innovation was the use of soft geometry, not so much in the planning but in the three dimensionality of the furniture which grows out of the floor in an organic way. The soft geometry is in the profile of the pieces, not in their footprint. The users can stroke the furniture, lie against it and feel its softness, all of which helps the visitors to kitchen linger and chat. 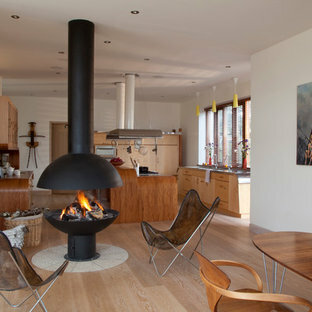 The fireplace is located in the middle between the cooking zone and the garden. There is plenty of room to draw up a chair and just sit around. The fold-out doors let the landscape into the space in a generous way, especially on summer days when the weather makes the indoors and outdoors come together. The sight lines from the main cooking and preparation island offer views of the garden throughout the seasons, as well as people coming into the room and those seating at the table - so it becomes a command position or what we call the sweet spot. This often results in there being a family competition to do the cooking. The woods are Canadian Maple, Australian rosewood and Eucalyptus. All appliances are Gaggenau and Fisher and Paykel. 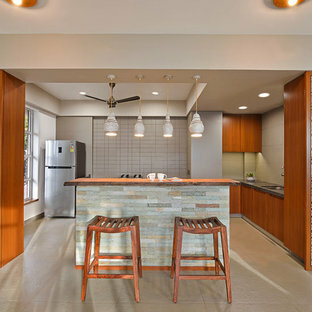 Small asian l-shaped open plan kitchen in Mumbai with an undermount sink, flat-panel cabinets, medium wood cabinets, beige splashback, stainless steel appliances, an island and beige floor. Photo of an asian galley open plan kitchen in Other with an integrated sink, flat-panel cabinets, medium wood cabinets, light hardwood floors, an island and brown floor. Inspiration for an asian galley eat-in kitchen in Other with flat-panel cabinets, medium wood cabinets, wood benchtops, green splashback, subway tile splashback, medium hardwood floors, an island, brown floor and beige benchtop. 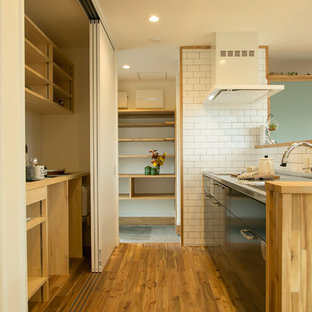 Photo of an asian single-wall open plan kitchen in Osaka with vinyl floors, black floor, beige benchtop, a single-bowl sink, flat-panel cabinets, medium wood cabinets, wood benchtops, green splashback and a peninsula. Inspiration for an asian galley eat-in kitchen in Other with a drop-in sink, flat-panel cabinets, white cabinets, wood benchtops, white splashback, stainless steel appliances, medium hardwood floors, an island and brown floor. Inspiration for an asian single-wall open plan kitchen in Other with stainless steel appliances, an integrated sink, flat-panel cabinets, white cabinets, light hardwood floors and a peninsula. 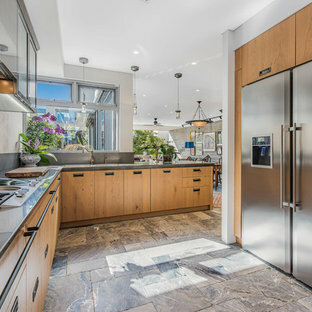 Photo of a large asian u-shaped eat-in kitchen in Los Angeles with a single-bowl sink, flat-panel cabinets, dark wood cabinets, multi-coloured splashback, stainless steel appliances, light hardwood floors and an island. This is an example of an asian kitchen in Other. 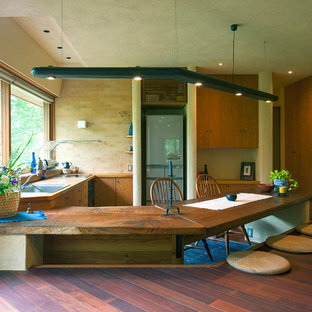 Large asian single-wall eat-in kitchen in Detroit with a double-bowl sink, dark wood cabinets, quartz benchtops, concrete floors, an island and brown floor. Photo of a mid-sized asian l-shaped open plan kitchen in Atlanta with grey cabinets, shaker cabinets, solid surface benchtops, white splashback, an island, stone tile splashback, stainless steel appliances, an undermount sink and dark hardwood floors.